VeryPDF Acrobat to RTF Converter is synonymous with excellent and top-notch document conversion software. Its advanced features ensure that the converted document is exactly like the original. By default this document conversion tool retains all formatting, tables and images of the original PDF in the converted Word doc. Text fonts and style, image placement, text columns, and overall document layout is preserved 100%. This is not all -- superscript, subscript, drop caps, and underlined text also remain as it is. The unique code of VeryPDF Acrobat to RTF Converter does all the work for you. Therefore, reformatting of converted document is not required. Acrobat to RTF Converter instantly converts PDF files into Microsoft Word documents that look just like the original - complete with all formatting and images! Information is set free - free to be edited and free to be integrated into your documents. Acrobat to RTF software is a standalone program and does not require Microsoft Word, Adobe Acrobat, or even Acrobat Reader. Acrobat to RTF is a batch PDF Converter that you can convert a lot of PDF files to word documents once time! saving your time! Acrobat to RTF is a standalone software, MS Word, Adobe Acrobat and Reader NOT required! You don't need to be an expert at computers to use Acrobat to RTF Converter. RTF (Rich Text Format) is a cross-platform file extension supported by almost all word processors regardless of operating system. The versatility of this file format often makes it the "common" format between incompatible word processors and operating systems. Since 1987, all versions of Microsoft Office on both the Macintosh and Windows operating system platforms have supported RTF-formatted documents. Several free open-source word processors (such as AbiWord, KWord, OpenOffice.org, etc...) support RTF files. Text-based RTF documents are smaller than comparable Microsoft Word documents. When inserting images into a RTF document and saved from Microsoft Word, the file size increases considerably (see link in References). One advantage that RTF files have over several newer word processing formats is its inability to support macros which are a set of automated instructions. This prevents viruses form being embedded in the file. RTF format is typically recommended when computer viruses are a concern. Microsoft has the intellectual property rights to the RTF format. 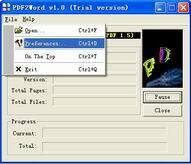 RTF word processing files are typically smaller, safer and can be used across a variety of operating systems.